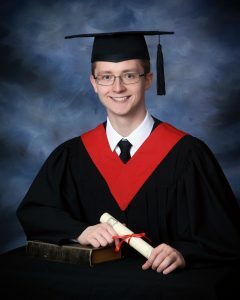 Justin Morlock, a graduate from Lindsay Thurber Comprehensive High School in Red Deer, is the recipient of this year’s Martha Kostuch Scholarship for Environmental Excellence sponsored by the Parkland Airshed Management Zone (PAMZ). This fall Justin will attend the University of Alberta, majoring in Political Science and working towards an Honours Bachelor of Arts degree. He plans to then pursue a law degree specializing in environmental law. With a law degree in hand, Justin hopes to be able to combine his passion for the environment with his interest in politics and the legal system. He would like to work with businesses to help them adapt to the changes in environmental regulations and with governments to develop policies that further their commitment to the environment. Active in his community, Justin is a great example of a balanced and contributing lifestyle. While attending Lindsay Thurber, Justin played an active leadership role in the development of their Edible Landscape Program. He also served on the City Wide Students Advisory Council, a local Red Deer group that develops policies to help students succeed in school. The $2500 Martha Kostuch scholarship is given out on a yearly basis to high school graduates living in the PAMZ region (west central Alberta) who wish to further their education in an area that will benefit the environment. The scholarship was established in 2008 to honour the legacy of Dr. Martha Kostuch, a founding Board member of PAMZ and lifelong environmental advocate.